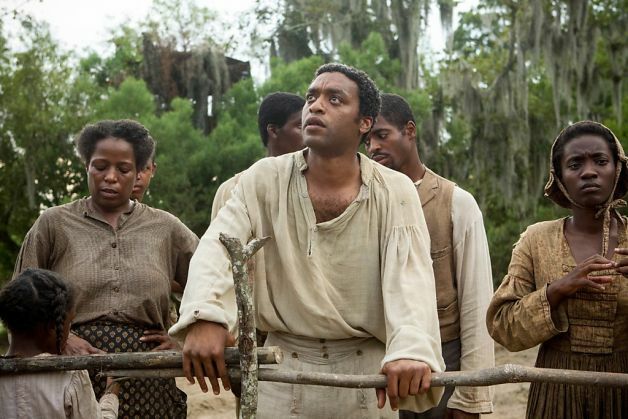 12 YEARS A SLAVE is a beautifully crafted film about an abhorrent subject. It’s quite an endurance test all-in-all, and I’m not sure whether I’ll ever be able to put myself through it again; not because of the quality of the film, which is excellent, but because of the deliberately oppressive atmosphere. The true story follows Solomon Northup, a black freeman working as a craftsman and musician and living with his family in New York. After hearing a job proposal from two seemingly affable men, he is drugged and wakes up in chains, a captive with a new name, no papers and no rights. He undergoes unimaginable hardships over a decade as he is moved around plantations and slave labour-dependent businesses in Louisiana, but never surrenders in his quest to regain freedom. Chiwetel Ejiofor, long overdue real attention, is mesmerising as Solomon Northup, giving a commanding lead performance, that says so very much with so little. The indignity and resilience in his eyes says it all. Director Steve McQueen’s muse Michael Fassbender is terrifying as Solomon’s second master, the obsessive psychopath Edwin Epps, Benedict Cumberbatch makes his mark in a small role as a kind-cruel slave owner and Lupita Nyong’o will surely be a talent to watch closely. What we witness is obviously upsetting, more often than not extremely hard to watch, as any drama about these horrific events should be. McQueen smartly uses his background as a visual artist to create achingly beautiful vistas of sub-tropical Louisiana that are at odds with the atrocities taking place in them. The rays of intense sunlight poking through a veil of cypress trees wouldn’t look out of place in the films of another committed visualist, Terrence Malick. I was surprised by the scenes that really got to me on an emotional level. Obviously, scenes of torture and abuse, captivity and brutality make a connection if you’ve got a working human heart, and they’re almost painfully hard-hitting, but the two moments that really got to me are much simpler and low-key. The first is when the seemingly kind Ford (Cumberbatch) presents Solomon with a fiddle, as a reward for thinking up a way of using his slave labour force more efficiently in his logging business. Here, Ford is giving Solomon back a part of his life as a freeman, but in doing so, becoming the cruellest character in the film. Yes, Epps brutalises his captives, torments them physically and psychologically, but Ford is setting about on Solomon’s very soul by giving him a tool to give him pleasure in captivity that he’ll never escape. He’s giving him hope and tying him to eternal despair in equal measure. The second involves Solomon getting increasingly frustrated and frantic at his attempts to fashion himself a pen to write a letter that might result in his freedom. Previously, we’ve seen him learn to play down his intelligence, to actively not stand out for his own safety. Here he wants to regain something from his civilised life, the ability to express himself though putting his thoughts down on paper, and the difficulty of regaining that simple freedom is rapidly sapping his will. We witness much of what we might expect from a slavery drama, but it does have some more unexpected beats as well. I’d never considered before the importance of slaves not just as free labour, but as a valuable commodity. Under his first owner, Solomon provokes a vicious slave-driver John Tibeats (Paul Dano) who continually singles him out for ridicule. When Solomon sees his chance and fights back, he is brutally punished, but Tibeats’ superior warns him that he can hurt him, but he can’t kill him. The life of a slave was worth a lot to his master, and represented a massive economic loss if they died. We also have the unexpected sight of a white man doing manual labour amongst the black slaves. Armsby (Garret Dillahunt) is a former overseer who turned to drink and destroyed his life, and is working amongst the slaves as a penance. Armsby’s brief appearance adds colour, and some interesting character contrasts with Solomon and Epps. It’s not a flawless film. Hans Zimmer’s score is perhaps a little too similar to his music in INCEPTION, sharing some of the same cues, and this can distract, and perhaps suggests a less showy musical accompaniment would be more appropriate for the treatment of the subject matter. Brad Pitt, with his power as the film’s producer accepting the role of the only nice white man in the film is also infuriating, almost as annoying as him still looking as per usual like a middle-aged wannabe rock star. 12 Years a Slave is an important film, one that needed to be made, and one we should all see once (though I’m absolutely not a believer in racial guilt). I detest the thought of someone describing a film like this offhand as “worthy” – that lazy label simply implies Steve McQueen just chose the most difficult subject matter for the sake of critical acclaim. That does McQueen a great disservice. He’s produced a piece of living, breathing and bleeding history that leaves a its mark on your very soul, and it’s thoroughly disserving of every award it gets. This entry was posted in Film, Film Review and tagged 12 Years a Slave, Benedict Cumberbatch, Biopic, Chiwetel Ejiofor, Film, Gravity, Hans Zimmer, Historical Drama, Inception, Lupita Nyong'o, Michael Fassbender, Movies, Oscars, Steve McQueen, Terrence Malick. Bookmark the permalink.